Help the first ever Afghan Winter Olympians | Untamed Borders - Adventure travel..
For the last five years, we have been working together with the Afghan Ski Challenge, enabling skiers to compete in Afghanistan’s first ski touring race. What started as a spontaneous idea by its founder Christophe Zuercher has since grown into a veritable development project. The race is operated by the Bamyan Ski Club, a non-profit association based in Zürich, this spring the Ski Challenge was held for the seventh time. Over the years, dozens of boys and girls have learned to ski with the Bamyan Ski Club ski school every February before the race. For two skiers, Ali Shah and Sajjad, the skiing developed into much more than just a fun new hobby. 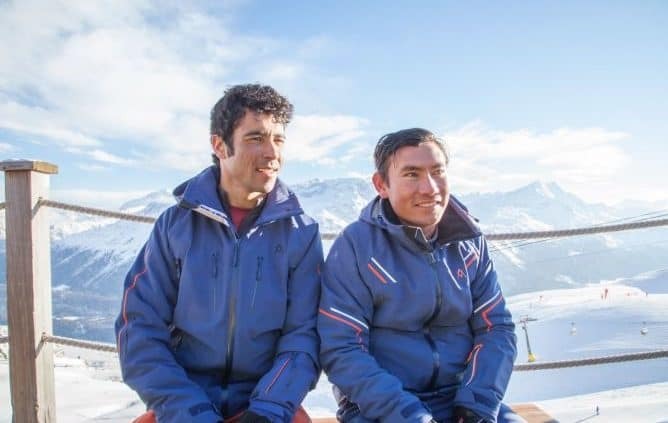 Today, the Bamyan Ski Club is asking for support to be able to help Ali Shah and Sajjad represent Afghanistan at the Winter Olympics in February 2018 in South Korea where they will become the first ever Afghan Winter Olympians. The sponsorship of the ski manufacturer Völkl, the commitment of the resort of St. Moritz and private donors have enabled Ali Shah and Sajjad to train in the Swiss mountains for the last three winters. The progress they have made is remarkable. In the qualifying races for the World Championships in St. Moritz last February, they reached the finish in both runs. However, Ali Shah and Sajjad still need further points at qualifying races throughout Europe this winter. The costs involved for travelling, support and material are however considerable, so far these costs aren’t covered. Please do consider participating in the Bamyan Ski Club crowdfunding campaign and by spreading the word. From Thursday, 19 October, this link will take you directly to the campaign. There are some great rewards for larger donations.